Earn up to 3,184 reward points. 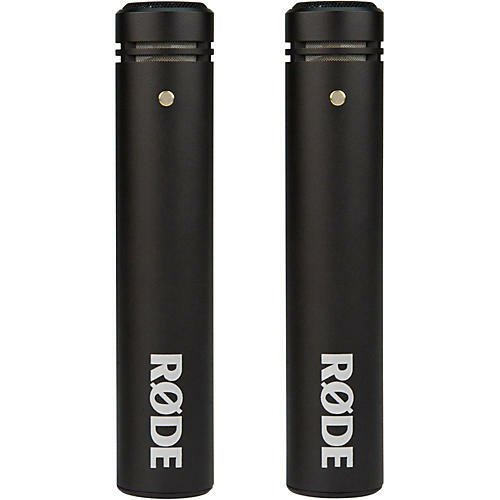 Matched pair of "pencil" microphones from Rode. The M5 Matched Pair are an ideal microphone set for studio or live capture. Stereo live recordings of festivals or drum overheads in the studio are both excellent environments for this highly detailed microphone pairing. Designed and made in Australia, the M5 is a compact ½" cardioid condenser microphone with low noise and a full frequency response. A result of many years' experience building the award-winning NT5 microphone, R˜DE has succeeded in making a high-quality ˜pencil' style permanently polarized condenser that will impress even the most demanding of artists and engineers. This matched pair has been carefully selected to ensure a variation of no more than 1dB sensitivity between the microphones. A premium foiled certificate is supplied to verify the authenticity of the pair. The M5 is finished with R˜DE's proprietary ceramic coating which offers a sleek matt black finish, and is supplied with WS5 windshields and RM5 stand mounts. Order now and experience unprecedented spread and detail in your stereo recordings.